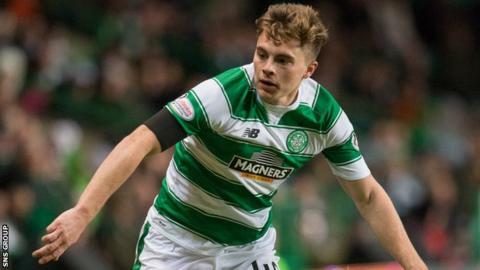 James Forrest has been urged to stick with Celtic and "become a main player" at the Scottish champions by the club's former goalkeeper Pat Bonner. The 24-year-old winger, whose current deal ends at the end of 2016, has turned down a four-year contract offer. "He should be a regular fixture in the starting line-up every single week," Bonner told BBC Scotland. "I would love him to stay at Celtic because there is no better place if you are playing really well." Forrest came through the youth ranks at Celtic, making his debut in 2010. The Scotland midfielder has scored twice in 32 appearances this season. Norwich and Queens Park Rangers are interested in the player but Bonner, who made over 640 Celtic appearances, thinks Forrest should remain where he is and prove himself. "James is a wonderful talent," said the former Republic of Ireland keeper, who spent his entire club career at Celtic Park. "He has great ability on the ball. "The problem with James is inconsistency. He's had his injuries, but for me it looks like a mental thing. "As soon as you walk on to the pitch you've got to make things happen, especially if you're playing at home for Celtic, especially if you're playing out on the wing - because some great players have played in that position over the years. "There are times when I'm surprised he's not in the team and there are times when he is that I'm surprised he's not effective enough. "When he is effective, there's nobody better at getting the fans up out of their seats. "But it's up to him, no one can do it for him." Forrest has made 13 Scotland appearances, starting on seven occasions. "He is still a young man and he also has an international career to think about," added Bonner, who won 80 caps. "The only way you're going to progress yourself for Scotland is to be playing every week and being successful and he can do that with Celtic. "Sometimes, going away for more money might not be the right decision. "Maybe he feels a wee bit stagnated and thinks he needs a change of scenery just to kick on. That can happen, of course."